Field Density Test of Soil by Sand Replacement Method. Determination of Field Density Test of Soil by Sand Replacement Method. (b) Measurement of volume of the hole. Sand Replacement Method Observation and Calculation. Water Content Determination of Sand Replacement Method. Result of Sand Replacement Method. Q & A about Sand Replacement Method. The field density test of soil is conducted in the field to know whether the specified compaction is achieved or not. Normally Sand Replacement Method is adopted for this purpose. Sand Replacement Method is also known as Sand Cone Method. The apparatus used in this field density test consists of a sand pouring cylinder, with pouring cone at its base. There is a shutter between the cylinder and the cone. The cylinder is first calibrated to determine the unit Weight of sand. For good results, the sand used should be uniform, dry and clean passing a 1.0 mm sieve and retained on a 600-micron sieve. 1. Sand cone apparatus, filled with uniformly graded sand passing through No. 20 sieve and retained on No. 30 sieve. 2. Density Plate, with a central circular hole of diameter equal to the diameter of pouring cone. 4. Balances sensitive to 1 gm & 0.1 gm. The cylinder is filled with sand weighed. A calibrating container is placed below the pouring cylinder, and the shutter is opened. The sand fills the calibrating container and the cone. The weight of the sand in the container and the cone is equal to the difference between the two observations. The pouring cylinder is again filled to the initial weight. The sand is allowed to run out of the cylinder, equal to the volume of the container and the shutter is closed. The cylinder is then placed over a plain surface, and the shutter is opened, the sand runs out of the of the cylinder and fills the cone. The shutter is closed when no further movement of sand takes place. The cylinder is removed and the sand formerly filling the cone is collected and weighed. w1 = initial weight of cylinder, with sand. w2 = weight of sand in the cone only. w3 = weight of cylinder after pouring sand into the cone and the container. Vc= Volume of the container. A tray with a central hole is placed on the prepared ground surface which had been cleaned and properly leveled. A hole about 100 mm diameter and 150 mm deep is excavated in the ground, using the hole in the tray as a pattern. The soil removed, is carefully collected and weighed (w). The sand pouring cylinder is placed over the excavated hole. The shutter is opened, and the sand is filled in the cone and the hole. When the sand stops running out, the shutter is closed. The cylinder is removed and weighed. The volume of the hole is determined by the weight of sand filled in the hole and the unit weight of sand. γs = (w1-w2)-w3 / Vc. w1 = weight of cylinder and sand before pouring into the hole. w3= weight of cylinder after pouring sand into the hole. γs= unit weight of sand, as found from calibration. The bulk unit in-situ soil is determined from the weight of soil excavated and the volume of the hole. 2. Weigh the sand cone apparatus full of known density sand. 3. Seat the density plate on leveled clean test ground. 4. Dig out soil 4” to 6″ deep with the same diameter as the density plate hole. Clean all loose soil out of the test hole with brush and spoon. 5. Collect all the excavated soil and weigh it. 6. Invert the sand cone apparatus over the density plate and open the valve to tilt the hole with sand. When the sand stops flowing, close the valve and remove the apparatus from the test hole. 7. Weigh the sand cone apparatus with remaining sand. 8. Collect as much of the sand from the hole as possible. 9. Put a sample of the excavated soil in the weighed moisture container and place it in the oven for water content determination. Initial wt. of Cylinder + cone + sand, before filling the hole. Final wt. of cylinder + cone + sand, after filling the hole. 5500 gm. Wt. of sand in hole + cone. 4900 gm. Wt. of sand in cone. 1700 gm. Wt. of sand in hole. 3800 gm. Density of sand. 1.71 gm/c.c. Volume of hole (V). 1871.34 c.c. Wt. of excavated soil. (W) 4800 gm. Wet density (bulk density) of soil = r =W/V. 2.56 gm/c.c. Read Also: Standard Penetration Test (SPT) of Soil – Procedure, Tools, Precautions. Wt. of Container = w1. 15.9 gm. Wt. of container + wet soil. = w2. 34 gm. Wt. of container + wet soil. = w3. 33.2 gm. Wt. of water (w2-w3) = 18.1 gm. Wt. of dry soil (w3-w1) = 17.3 gm. Water Content = m.c. = (w2-w3)/(w3-w1) x100. 46 %. The field dry density of soil is 2.44 gm/c.c. 1. Sand used in this test should be dry. 2. Excavated soil should be collected as the whole. 3. Sample collected for determination of water content should be kept covered. 4. Calibration of cone apparatus should be done before starting the test. Q.1: What is Relative Compaction? Ans: The ratio between field dry density and Lab dry density is known as Relative Compaction. Q.2: The term FDT stands for? Ans: FDT stands for Field Dry Density. Q.3: What are the specifications of Sand used in Sand Replacement Method Test? Ans: It should be clean, dry, and uniform. Q.4: Give the formula used to determine moisture content. Ans: m.c = Weight of wet soil – Weight of dry soil / Weight of dry soil x 100. Thanks for Reading! 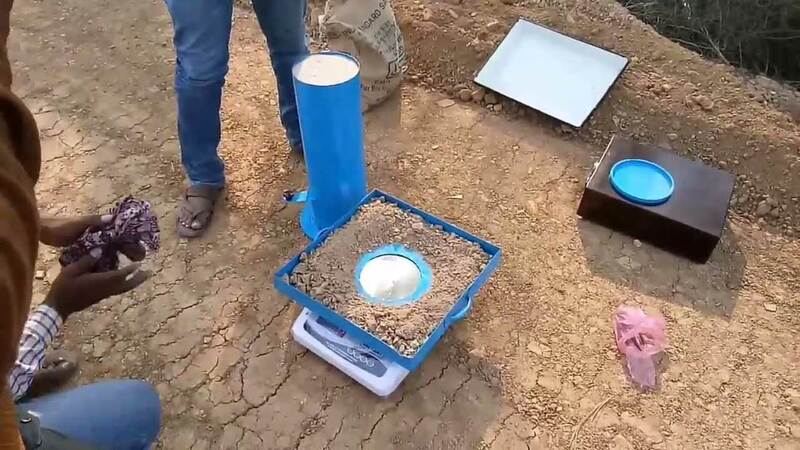 “Field Density Test of Soil by Sand Replacement Method.” Don’t Forget to Share it. Read Also: Atterberg Limits: Determination of Plastic, Liquid, & Shrinkage Limits. Thanks a lot. Very simple and sweet experiment on sand replacement method of compaction test. Why are we using sand to replace the soil excavated from the hole?. How many samples to be taken as per IS CODE?